“Do not despise your inner world,” philosopher Martha Nussbaum admonished in her letter of advice to the young. “By acceptance of all aspects of life, good and bad, right and wrong,” Henry Miller wrote in contemplating the wisdom of the heart half a century earlier, “the static, defensive life, which is what most people are cursed with, is converted into a dance, ‘the dance of life.’”But in a culture that consistently mistakes perfection for wholeness, we are discouraged from dancing with the brokenness, messiness, and imperfection of our interior lives — and yet only when do so can we begin to feel whole and measure our lives in terms of deep meaning rather than superficial success. How to do this is what New York Times columnist David Brooks, one of the finest writers and thinkers of our time, explores in The Road to Character (public library) — an elegant and lucid case for how fostering a “counter-tradition of moral realism” can help us snap out of the “self-satisfied moral mediocrity” that defines modern life, which leaves us in a state of “unconscious boredom” (notthe creatively and spiritually fruitful kind), “not really loving, not really attached to the moral purposes that give life its worth.” What emerges is a pitch-perfect clarion call, issued not with preachy hubris but from a deep place of humility, for awakening to the greatest rewards of living. 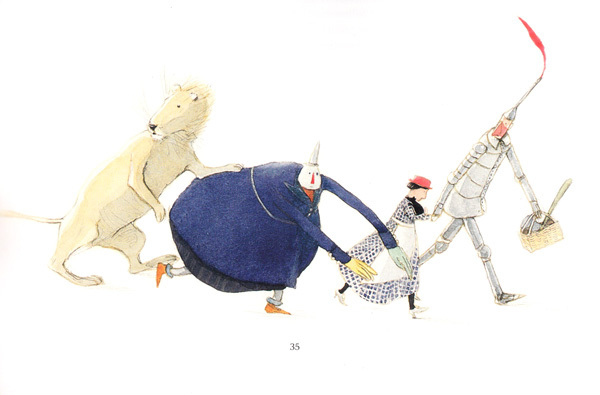 Illustration by Lisbeth Zwerger for ‘The Wonderful Wizard of Oz.’ Click image for more. Brooks argues that we live in a constant tussle with these two contradictory parts of ourselves that rip the psyche asunder with their conflicting demands — the ambitious and status-oriented achiever, driven by the “résumé virtues” and stimulated by external rewards, and the moral aspirant propelled by the “eulogy virtues,” which offer their own internal satisfactions. The former is goaded by cultivating and showcasing our personal strengths; the latter by contemplating and confronting our inner weaknesses. We are called to fulfill both personae, and must master the art of living forever within the tension between these two natures. It’s a moral logic, not an economic one. You have to give to receive. You have to surrender to something outside yourself to gain strength within yourself. You have to conquer your desire to get what you crave. Success leads to the greatest failure, which is pride. Failure leads to the greatest success, which is humility and learning. In order to fulfill yourself, you have to forget yourself. In order to find yourself, you have to lose yourself. 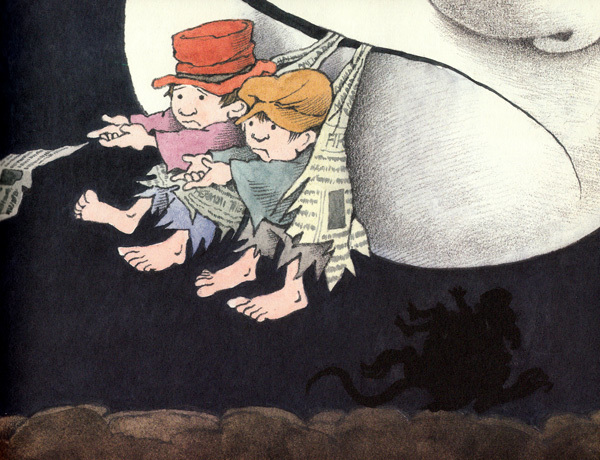 Illustration by Maurice Sendak from ‘We Are All in the Dumps with Jack and Guy.’ Click image for more. We live in a society that encourages us to think about how to have a great career but leaves many of us inarticulate about how to cultivate the inner life. The competition to succeed and win admiration is so fierce that it becomes all-consuming… The noise of fast and shallow communications makes it harder to hear the quieter sounds that emanate from the depths. We live in a culture that teaches us to promote and advertise ourselves and to master the skills required for success, but that gives little encouragement to humility, sympathy, and honest self-confrontation, which are necessary for building character. I was born with a natural disposition toward shallowness. I now work as a pundit and columnist. I’m paid to be a narcissistic blow-hard, to volley my opinions, to appear more confident about them than I really am, to appear smarter than I really am, to appear better and more authoritative than I really am. 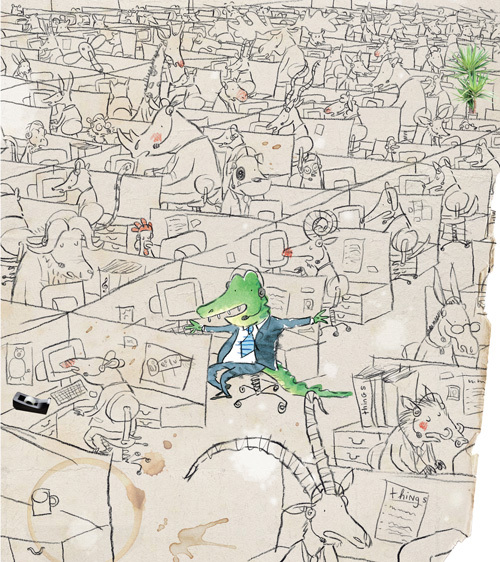 I have to work harder than most people to avoid a life of smug superficiality. I’ve also become more aware that, like many people these days, I have lived a life of vague moral aspiration — vaguely wanting to be good, vaguely wanting to serve some larger purpose, while lacking a concrete moral vocabulary, a clear understanding of how to live a rich inner life, or even a clear knowledge of how character is developed and depth is achieved. 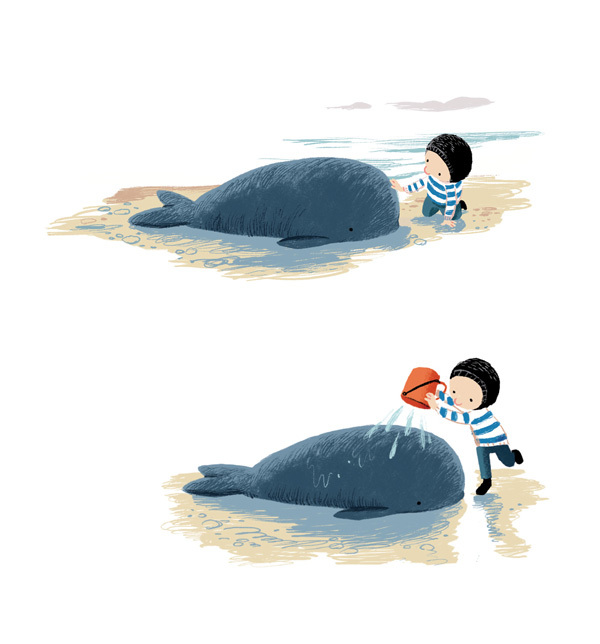 Illustration from ‘The Storm Whale’ by Benji Davies. Click image for more. You grade yourself on a forgiving curve. You follow your desires wherever they take you, and you approve of yourself so long as you are not obviously hurting anyone else. You figure that if the people around you seem to like you, you must be good enough. In the process you end up slowly turning yourself into something a little less impressive than you had originally hoped. A humiliating gap opens up between your actual self and your desired self. My general belief is that we’ve accidentally left this moral tradition behind. Over the last several decades, we’ve lost this language, this way of organizing life. We’re not bad. But we are morally inarticulate. We’re not more selfish or venal than people in other times, but we’ve lost the understanding of how character is built. The central fallacy of modern life is the belief that accomplishments of the [résumé] realm can produce deep satisfaction… The ultimate joys are moral joys. 1. We don’t live for happiness, we live for holiness. Day to day we seek out pleasure, but deep down, human beings are endowed with moral imagination. All human beings seek to lead lives not just of pleasure, but of purpose, righteousness, and virtue. As John Stuart Mill put it, people have a responsibility to become more moral over time. The best life is oriented around the increasing excellence of the soul and is nourished by moral joy, the quiet sense of gratitude and tranquillity that comes as a byproduct of successful moral struggle. The meaningful life is the same eternal thing, the combination of some set of ideals and some man or woman’s struggle for those ideals. Life is essentially a moral drama, not a hedonistic one. 2. Proposition one defines the goal of life. The long road to character begins with an accurate understanding of our nature, and the core of that understanding is that we are flawed creatures. We have an innate tendency toward selfishness and overconfidence. We have a tendency to see ourselves as the center of the universe, as if everything revolves around us. We resolve to do one thing but end up doing the opposite. We know what is deep and important in life, but we still pursue the things that are shallow and vain. Furthermore, we overestimate our own strength and rationalize our own failures. We know less than we think we do. We give in to short-term desires even when we know we shouldn’t. We imagine that spiritual and moral needs can be solved through status and material things. 3. Although we are flawed creatures, we are also splendidly endowed. We are divided within ourselves, both fearfully and wonderfully made. We do sin, but we also have the capacity to recognize sin, to feel ashamed of sin, and to overcome sin. We are both weak and strong, bound and free, blind and far-seeing. We thus have the capacity to struggle with ourselves. There is something heroic about a person in struggle with herself, strained on the rack of conscience, suffering torments, yet staying alive and growing stronger, sacrificing a worldly success for the sake of an inner victory. 5. Pride is the central vice. Pride is a problem in the sensory apparatus. Pride blinds us to the reality of our divided nature. Pride blinds us to our own weaknesses and misleads us into thinking we are better than we are. Pride makes us more certain and closed-minded than we should be. Pride makes it hard for us to be vulnerable before those whose love we need. Pride makes coldheartedness and cruelty possible. Because of pride we try to prove we are better than those around us. 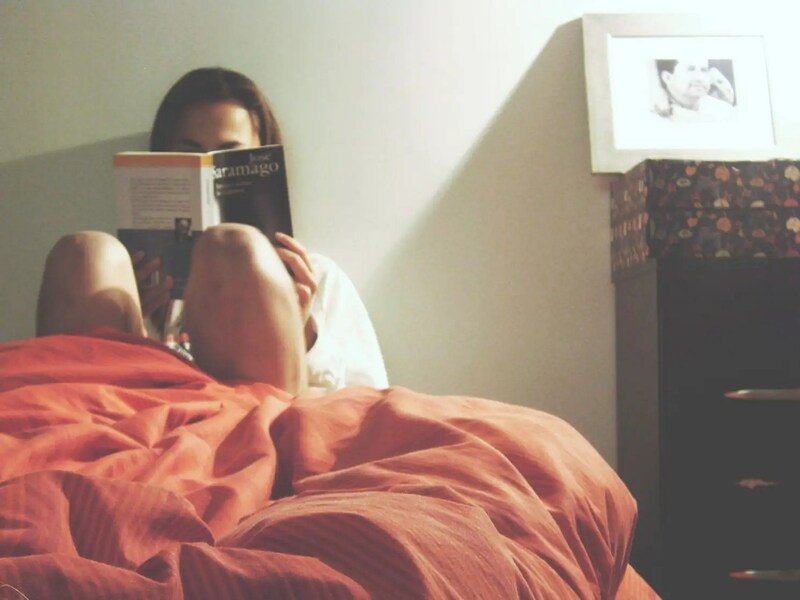 Pride deludes us into thinking that we are the authors of our own lives. 10. We are all ultimately saved by grace. The struggle against weakness often has a U shape. You are living your life and then you get knocked off course — either by an overwhelming love, or by failure, illness, loss of employment, or twist of fate. The shape is advance-retreat-advance. In retreat, you admit your need and surrender your crown. You open up space that others might fill. And grace floods in. It may come in the form of love from friends and family, in the assistance of an unexpected stranger, or from God. But the message is the same. You are accepted. You don’t flail about in desperation, because hands are holding you up. You don’t have to struggle for a place, because you are embraced and accepted. You just have to accept the fact that you are accepted. Gratitude fills the soul, and with it the desire to serve and give back. 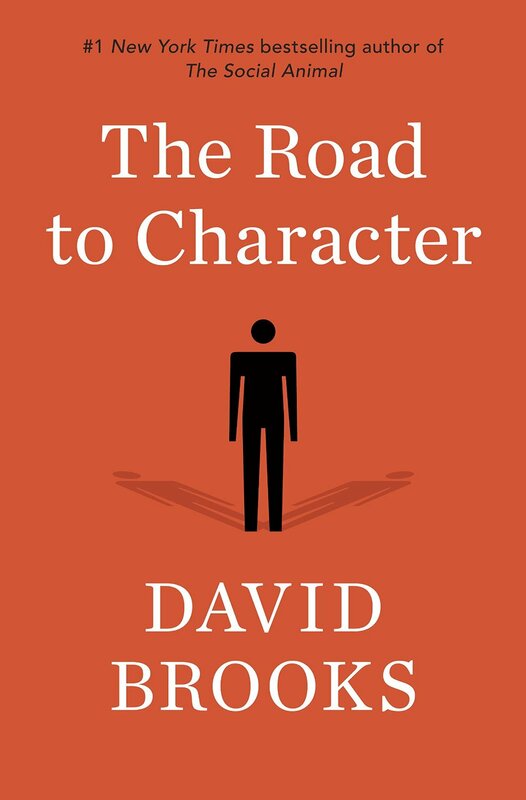 The Road to Character is an essential read in its entirety — Anne Lamott with a harder edge of moral philosophy, Seneca with a softer edge of spiritual sensitivity, E.F. Schumacher for perplexed moderns. Complement it with 16th-century godfather of blogging Montaigne on how to live and Susan Sontag onwhat it means to be a moral human being.